What Exactly Is Biking Brotherhood? Everyone agrees that the leisure motorcycle scene in India is changing for the better. The number of riders taking the trouble to buy and use riding gear and go for long rides seems to be increasing every passing year. And that is a fantastic thing. Whenever I ride a motorcycle in the US and I cross another motorcycle I give the other rider the universal biker wave, basically a victory sign with the left arm lowered. Almost always the other rider returns the wave, unless he is cornering, in which case I don’t wave in the first place. I simply nod to acknowledge the other rider and wish him or her a safe ride. When riding in India if I come across anyone wearing a riding gear I wave at them. I don’t do the victory sign wave as that concept hasn’t yet caught on here. The other riders may think I’m indicating that their side stand is down or something. I simply raise my left hand. The other rider sometimes responds by waving back and sometimes he doesn’t. At first I thought it was because riders in India were new to the concept of waving. But slowly I started to see a pattern. And I didn’t like the pattern I saw. I own three motorcycles – a 2012 Royal Enfield Thunderbird 350, a 2013 Harley-Davidson Fat Boy and a 2015 KTM Duke 390. 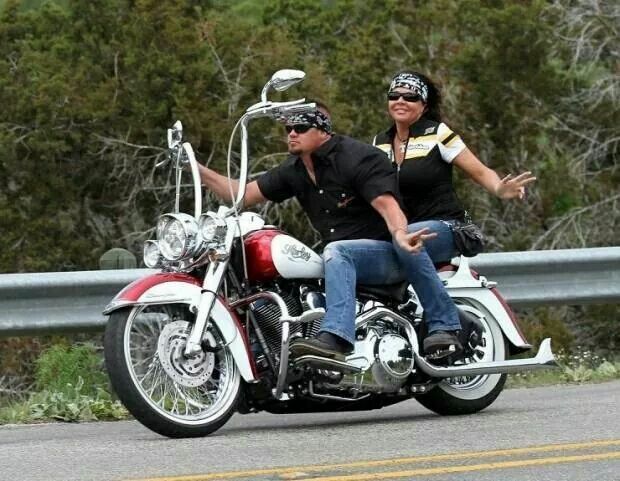 If I wave at a rider when riding my Fat Boy, I can almost be certain that the other rider will wave back, no matter what motorcycle he is riding. If I’m riding the Thunderbird or the Duke and the other rider is riding a Harley or any other “expensive” motorcycle, I can almost be certain that he will not wave back. My theory was validated at the recently concluded India Bike Week in Vagator, during which Goa was inundated with motorcycles of all brands, shapes and sizes. On one of the days I rode my Duke to Vagator and crossed many riders riding “expensive” motorcycles, mostly Harleys. Only a couple of Harley riders waved back at me. However, each and every Royal Enfield and KTM rider returned my wave. The next day I rode my Fat Boy along the exact same route and came across a similar mix of motorcycles. Each and every Harley rider waved back at me. The funny thing is I could notice a look of surprise on the faces of the Enfield and KTM riders as they wondered how a Harley rider acknowledged their existence on the road. I find this discrimination particularly rampant among Harley owners. And its not just a Harley versus other motorcycles thing. Some Harley owners even look down on owners of the “cheaper” Harley motorcycles. I remember sitting in a cafe in Goa with a few Harley owners when one of them suggested that when we ride as a group on a HOG ride, the owners of the Street 750, the entry level Harley motorcycle, should not be invited to ride with us. I pointed out that they too were Harley owners and HOG stood for “Harley Owners Group”. To which the other rider replied that if we let the Streets ride with us they should be made to ride in the front of the group and act as pilots for the bigger and more expensive Harleys. That did it for me and I lost it. I remember giving that Harley owner a piece of my mind. Another rider intervened and changed the topic before the conversation became a full blown argument.